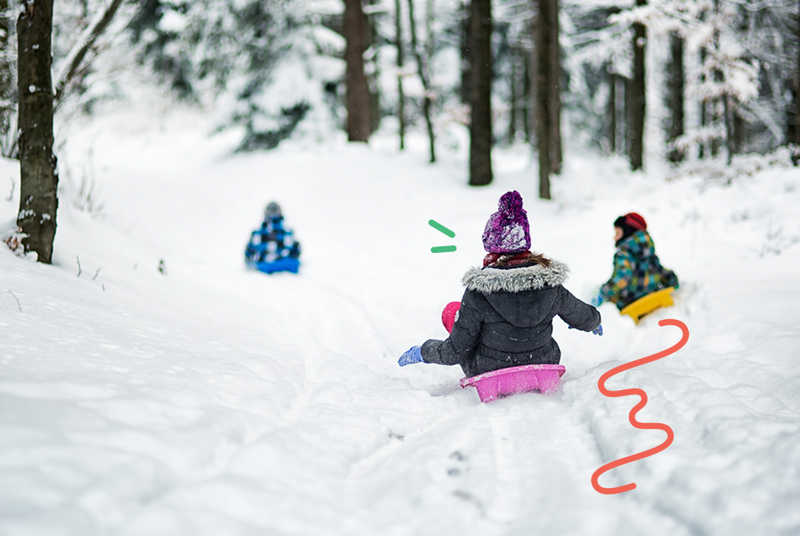 As a parent, you might want to keep your children inside during the colder months, but it’s actually beneficial to let them play outside during the winter. Believe it or not, the colder weather helps them stay healthier and even boosts their imaginations. So, if you’re keeping your kids indoors this winter, bundle them up and let them out to play instead. It’s common to think kids will catch a cold if they’re outside in the winter. Ironically, playing outside could help them avoid getting a cold or the flu. Simply going outside and getting exercise helps reduce the chance of illness by 25% to 50%. When kids stay indoors, they’re exposed to germ and bacteria filled air that just recirculates. Cool, fresh air helps reduce the chance of getting sick. Plus, the winter weather gives them a chance to build a stronger immune system, leading to fewer illnesses. Of course, kids also get more natural Vitamin D by playing outside. The winter months force children to be more creative. It’s not as easy to just jump on a swing or climb a tree. Instead, kids might have to figure out ways to build a fort in the snow. Plus, winter is normally a time when kids stay glued to screens. Getting outside, even if it means wearing several layers, makes them use their imaginations versus relying on their phone or tablet. Sometimes the best way for kids to learn is through experience. If they stay in an optimal temperature 24/7, they’re not going to understand what it means to be prepared for the weather. Going outside in the winter and having their hands get cold or getting soaked playing the snow gives them first-hand experience as to why bundling up is a good idea. Exercising in the cold is a little different than exercising in the heat. The body works harder to stay warm, burning more calories, which also helps strengthen the heart. This works for both kids and adults, so get outside and play with them. Of course, if it’s snowy outside, kids also benefit from new challenges like walking and running in the snow, making them stronger and more confident. Seasonal Affective Disorder is a form of depression that happens as seasons change. One way to prevent this from happening to your kids is to get them outside during the winter. Playing outdoors reduces the risk of SAD and helps them feel happier. Feeling happier and getting more exercise will even help them do better in school and socialize more. As long as children stay bundled up and don’t get too cold, let them go out and play this winter.